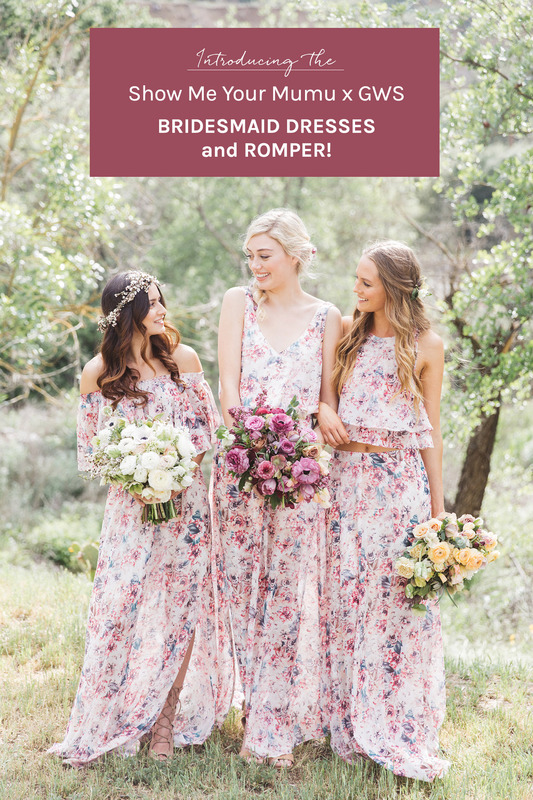 We are so excited to share a fun collab we have been working on with our friends at Show Me Your Mumu – we designed a gorgeous floral print together and selected 3 of their most popular maxi dress styles as well as a getting ready romper! The exclusive designs launch TODAY and are available only at Show Me Your Mumu. 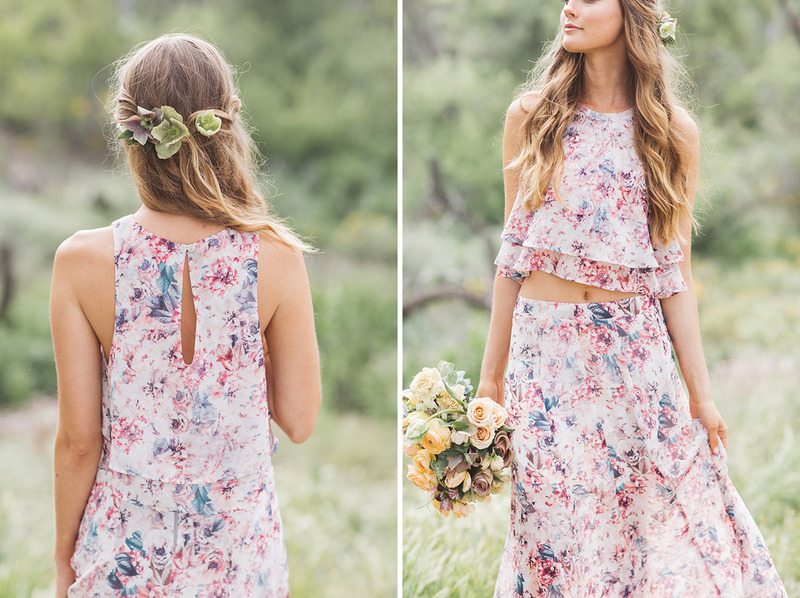 Our floral print is SO perfect for weddings. The floral print is a perfect balance of those raspberry reds, peachy pinks, and minty greens that we seriously can’t get enough of….accent her with pewters and silvers to really let her shine! 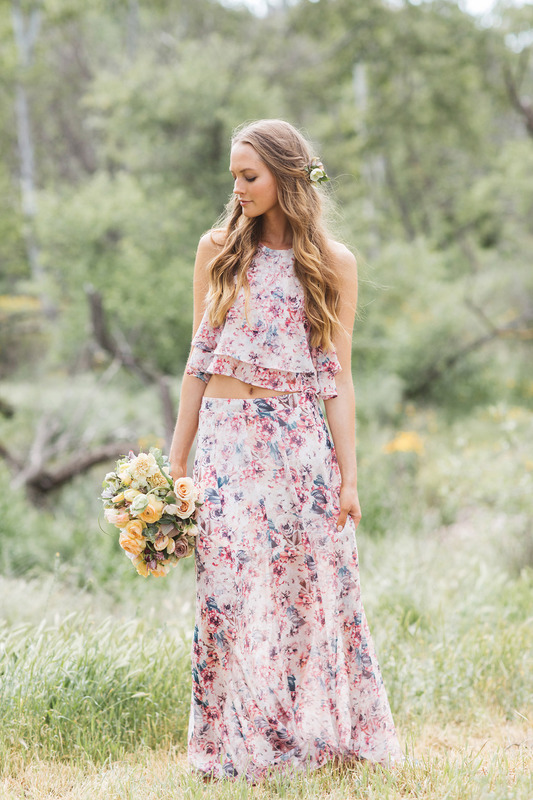 This print is so versatile, it’s not only perfect to wear to a wedding, but for a bride on her honeymoon or, if you don’t have any weddings on the books this summer, it’s makes for an incredible summer dress! 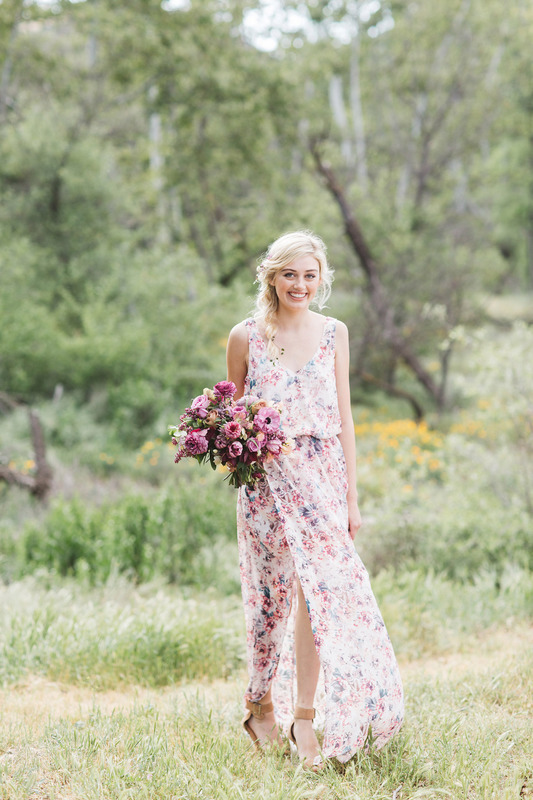 To celebrate the launch + help show off the GORG dresses, we styled a bunch of pretty looks at one of our favorite local venues, Triunfo Creek Vineyards in Malibu, California and brought along Brandon Kidd to capture all the gorgeousness! Your love for the King Crop will make you weak in the knees the second you slip into this little number. Cropped to flatter with your favorite mini skirt, ballgown or swing shorts this top is sure to be a staple in your closet and your LIFE! The skirt is high waisted and zips you up so you look teeny tiny, and then sweeps out so long and full, just like a princess in a ballgown. Her pretty ruffle is flattering on everyone, and her elastic scrunch neck line will let you to dance all night long. I think this might just be one of the most versatile dresses we have ever seen. Wear her as a tube dress, off your shoulders, or even on your shoulders if you prefer! Wear her to your bestie’s wedding or in your bestie’s wedding. Dress her down for a moonlight stroll down to the ocean or to that summertime school reunion and you now no longer have to dread finding a dress! Her soft V neck and low back are ultra feminine and flattering to every body, the slit in the wrap around skirt lets you pull an Angelina stance whenever you need (you never know when you’re gonna need it). Chill enough for a little pointy toed bootie and classy enough for an elegant heel. Kendall is on track to be your new go-to maxi! 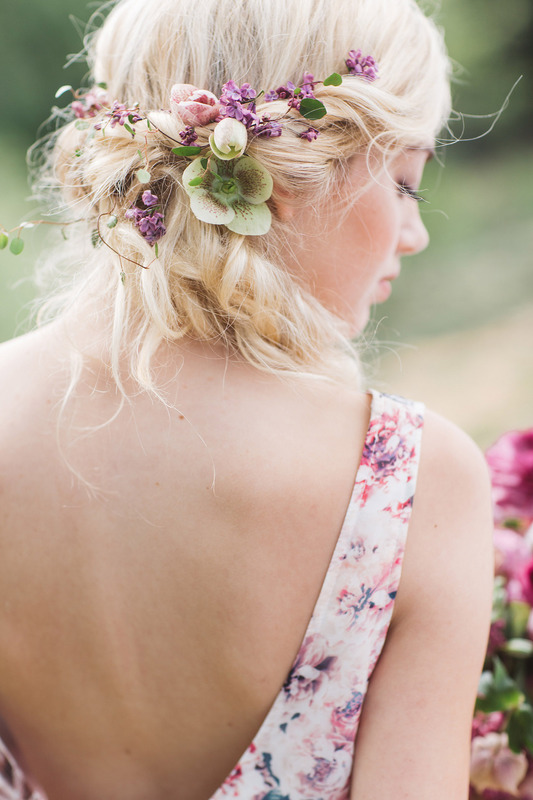 And the gorgeous hair + makeup is by Symmetry Beauty. 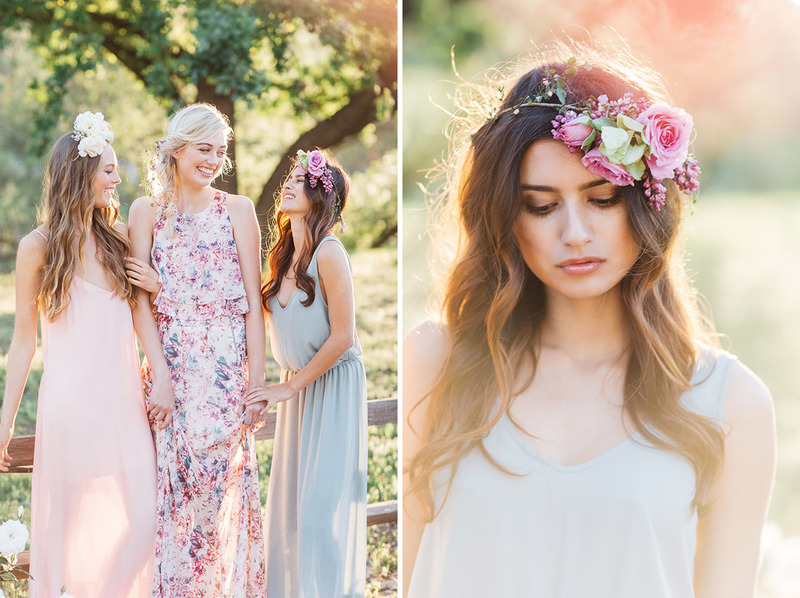 You’re besties and sisters will love you when they wear these dresses! And since I own quite a few Mumu dresses, can attest that they are super comfortable, don’t wrinkle and are perfect for so many of your summer events! Last but definitely not least, we also have our print in a romper! Such a comfy + delicate beauty….perfect for lounging with the ‘maids. She’s perfect gift for all your ladies – or for the bride to get ready on the day of and use repeatedly on the honeymoon! 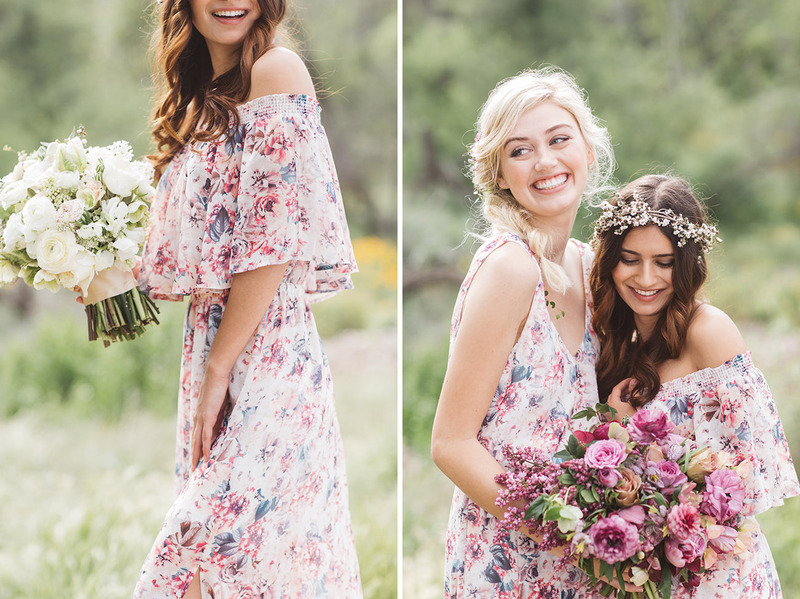 We love our dresses for a perfect boho, beach or garden wedding…and did we mention that Mumu also carries simple white dresses that are perfect for the bride? In addition to launching our collab today, Show Me Your Mumu also launched a full line of other colors and prints. 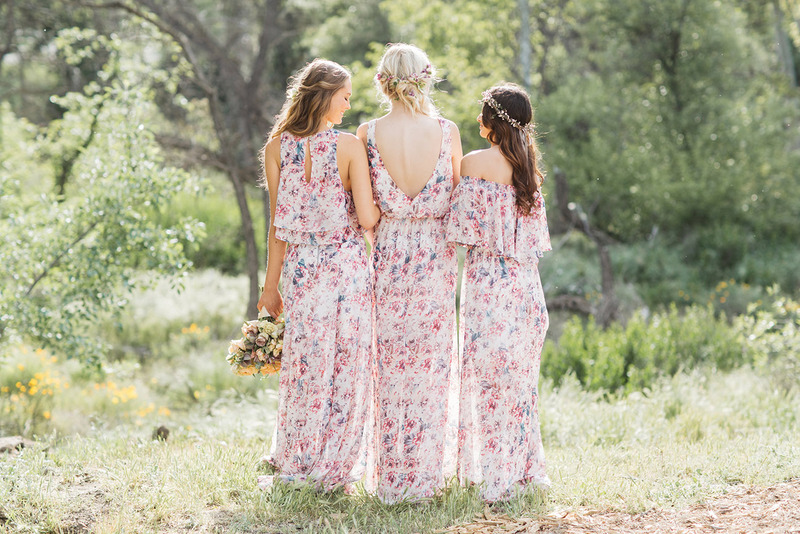 We just LOVE the colors they selected and are feeling the pairing solids with prints as well for your bridesmaids…or how perfect are these dresses to wear to one of the many weddings you have this summer?!? We hope you love our collection as much as we do….we had a blast working with the super talented team at Show Me Your Mumu and are already dreaming up new prints for the fall!! 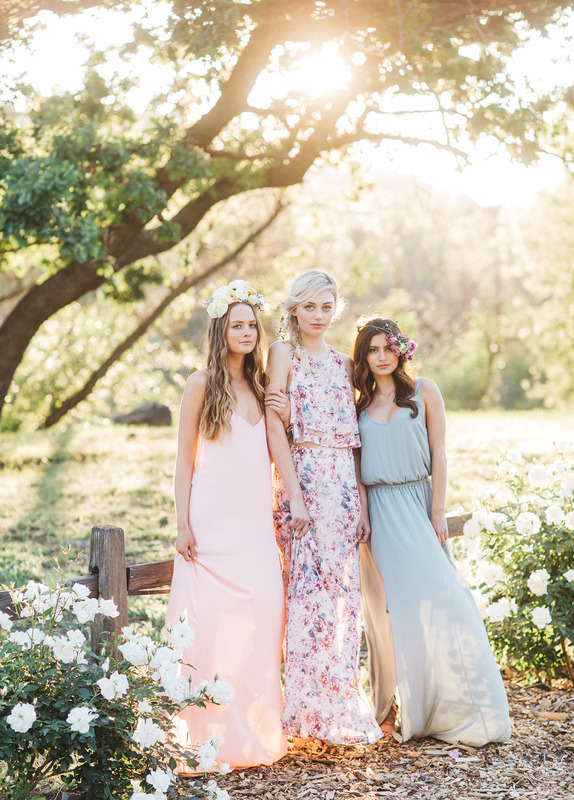 Big thanks to this amazing team for bringing our collection to life in this editorial! Beautiful shoot! 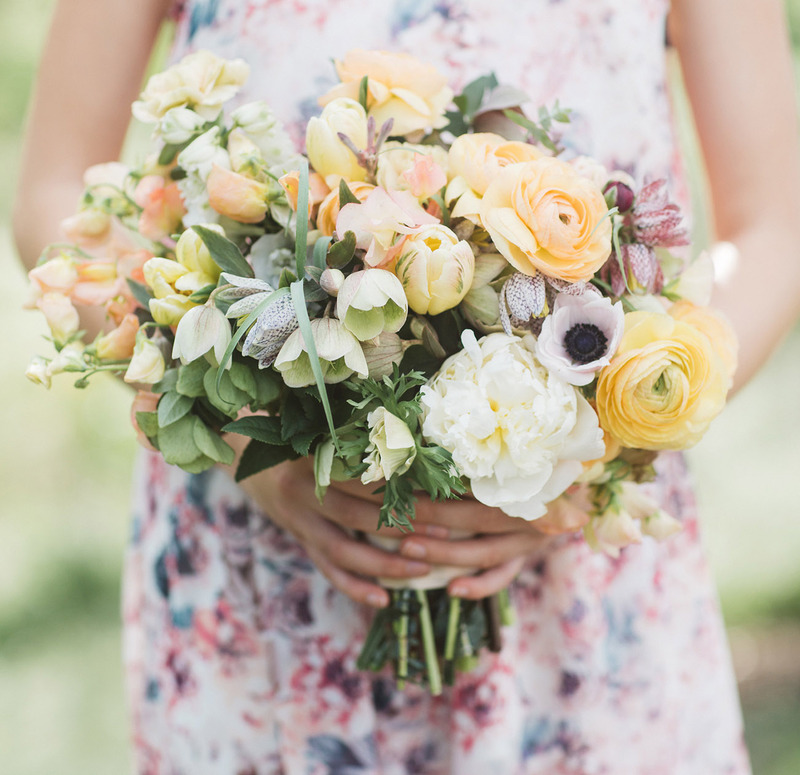 I love all the flowers by Jenn Sanchez! So gorgeous. Well done. Gorgeous shoot! These would be perfect for any summer wedding! Wonderful! 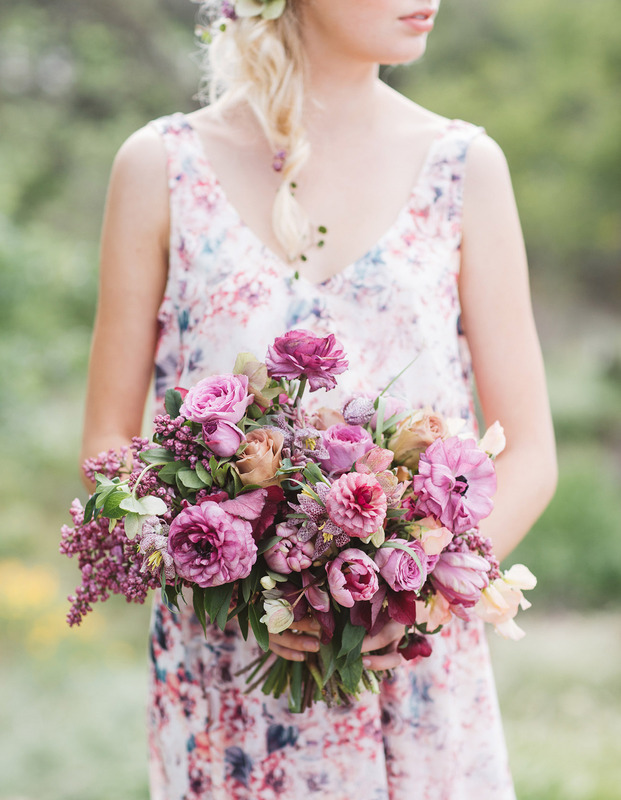 So much floral beauty, would be stunning for a summer wedding! 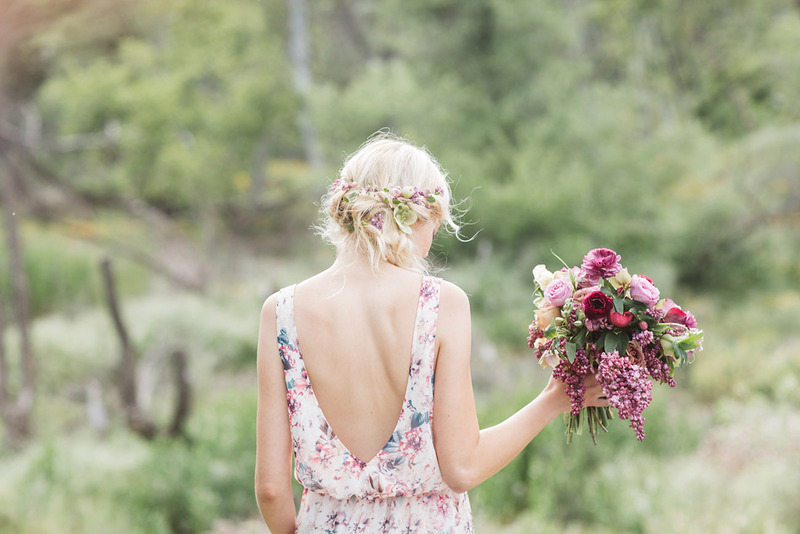 I always get emotional when looking at pics with bohemian themed wedding stuff. Beautiful! These are so rad! 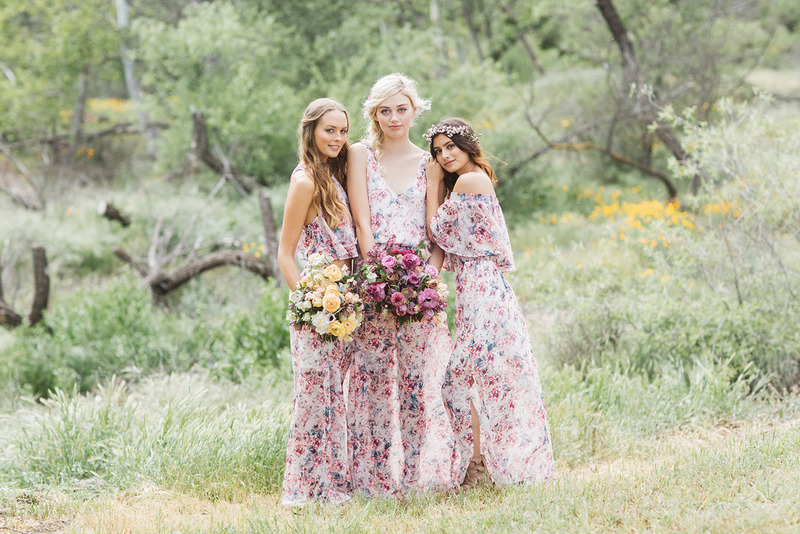 Nice to have bridesmaid options with cool pattern and boho cuts. 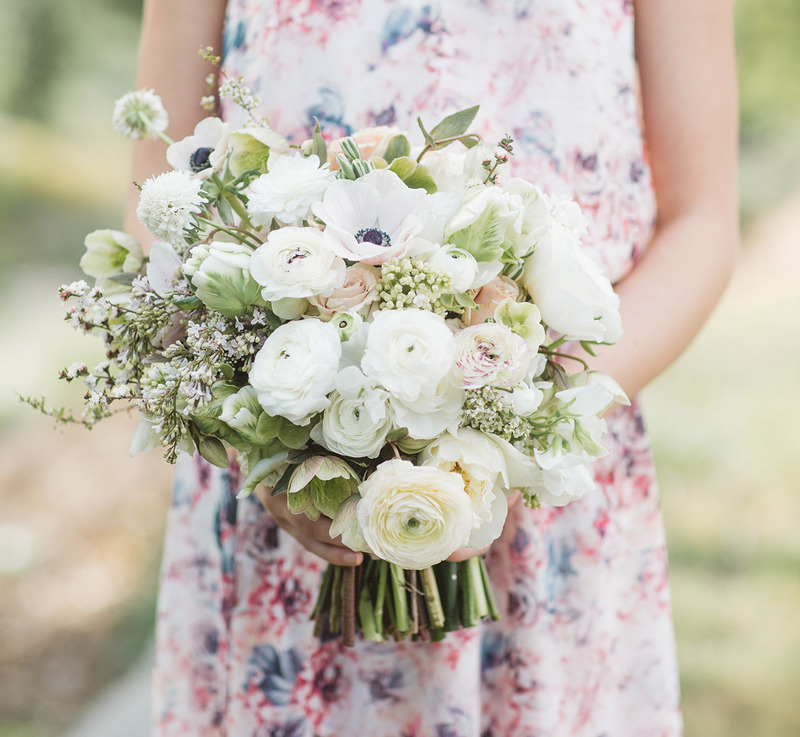 Love the soft summery florals!